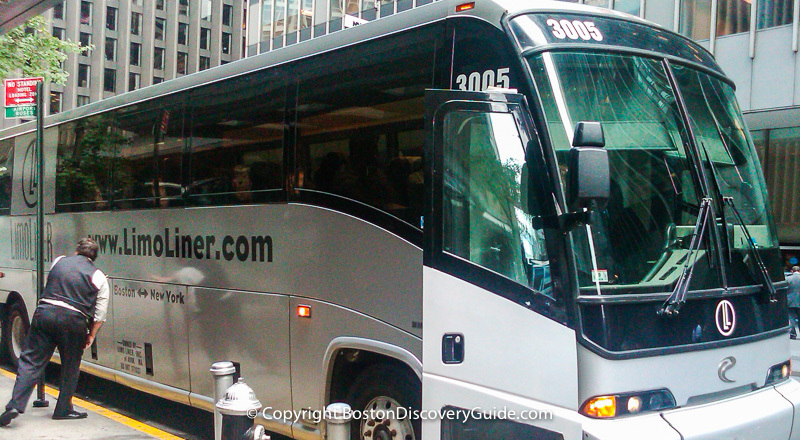 What Is the Best Bus Service from Boston to New York? Red-hot competition among Boston - New York bus companies means you'll find a lot of bargains . . . and Go Buses service from Cambridge and Newton gives you even more choices. For NYC to Boston travel, bus fares with free WiFi and luxury extras almost always cost less - sometimes MUCH LESS - than you'd pay for Amtrak Acela train tickets or the cheapest flight to New York. LimoLiner, Go Buses, Megabus, Bolt Bus, Greyhound, Lucky Star "Chinatown" buses. . . these are just a few of the companies competing for the lucrative traffic along the Boston - NYC - Philadelphia - Washington DC corridor. You'll find some big differences between destination and drop-off points, amenities, service, and cost - so it pays to look at each option and decide which fits YOUR needs the best. Which Boston - New York bus service is best? Although all 6 choices reviewed on this page get you back and forth between Boston and New York, amenities range from luxury to no-frills, with a couple of attractive mid-range options. Most of the buses have on-board restrooms. Travel time listed on this page is based on what the bus companies state. In reality, traffic may add another 1 to 1.5 hours each way. Fares are for 1-way only. In some cases, round trip tickets may cost less. 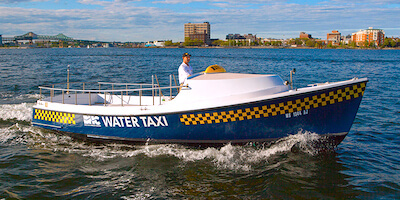 Bonus: Discounted hotel rates - In Boston, the Back Bay Hilton and Sheraton Framingham, and in NY, the Hilton New York Midtown offer special LimoLiner deals - 10% off room rate and 20% off food at both Hiltons, and 15% off room rate and complimentary shuttle service within 5 miles at the Sheraton. How to Book: Check room availability for your dates: Back Bay Hilton | Sheraton Framingham | Hilton New York Midtown. If a room is available for your dates, go to the LimoLiner website, book your trip on LimoLiner, and they will send you an email confirmation with a link to the hotel to reserve your room and get the special rate. "Great experience! It is a luxury coach bus . . . reservation process was easy and the bus left on time. The Limo Liner provides complimentary internet access as well as a movie, CNN on TV, a full meal, snacks, beverages, and in the evening, wine. The attendant was very friendly and the ride was smooth, even though we hit traffic and the trip was about 5.5 hours. Having traveled many times on the Acela, I can easily compare the two. 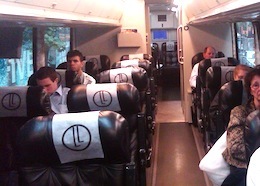 Limo Liner is slightly less money, and includes lots of amenities. However, travel is time longer. Acela is faster and less likely to face delays, but meals and drinks are extra and internet access can be iffy at times." Amenities: Go Buses (owned by Academy Bus) provide free WiFi, power outlets, free bottled water, and high-back seats on its 55-passenger coaches - and the only bus service between Cambridge, MA - New York City and Newton, MA - NYC - a huge bonus to students from Harvard, MIT, Boston College, and all the other colleges and universities in Cambridge and Newton. Amenities: Greyhound provides free WiFi, power outlets, leather seats on some buses. All seats are window or aisle (no middle seats). Overhead luggage storage. Amenities: Bolt bus offers free WiFi, power outlets on some buses, reserved seats, and occasional $1 fares. Guaranteed seat? Yes, if you book online and arrive at the boarding point at least 15 minutes before departure time. Typical 1-way fare: About $10 - $39; ticket cost is higher closer to departure date, so you'll save by making your reservations as early as possible. Typical 1-way fare: $5 - $20 for non-refundable non-changeable discount tickets; full fare tickets cost more and are also non-refundable but can be changed. 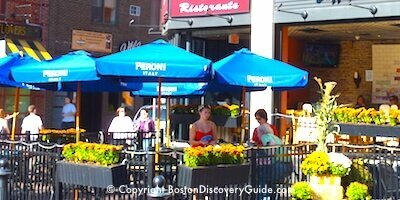 Boston Insider Tip: Reserve in Advance! Boston's huge student population competes with business and leisure travelers for seats on the buses between Boston and New York. It's not unusual for ALL buses to completely sell out around weekends, and getting reservations for certain holidays such as Thanksgiving can be notoriously difficult. Best tip: Book early, and make sure your seat is confirmed! In addition to driving, you have 2 other choices for travel between Boston and New York: Amtrak train service, and flying - specifically, cheap flights. Seats are spacious and comfortable, work space accommodates a laptop, and food and beverages are available to buy - although both Penn Station and South Station offer much better food choices than you'll find on board. Unlike the Boston - New York bus services, Amtrak does not get impacted by heavy traffic on the highway. However, trains do not always depart or arrive on time, and equipment issues occasionally cause significant delays. However, for convenience, comfort, and general reliability as well as a pleasant ride through the New England countryside, Amtrak is hard to beat. At some times of the day, there is little difference in travel time between regular service and the Acela. Seating on the Acela is somewhat more spacious, especially in first class, where meals are complimentary and served at your seat - but again, there is not a big difference compared with seating in the regular service trains. Amtrak departs/arrives from South Station and Back Bay Station in Boston; there is also a stop on Route 128 at Westwood. The train arrives/departs from Penn Station in New York. Cheap flights to New York from Boston usually cost about the same or 10% - 20% less than the Acela, and may be slightly faster door-to-door, even with airport security. Although any savings may be eaten up by ground transportation time and expenses if you're heading into most areas of Manhattan, flying can be the best choice if your target destination is outside of the city. Sometimes, however, you can find really cheap fares - too low to pass up! A good place to check for cheap New York flights is on Expedia. Don't forget to also look for special deals for NYC hotels as well. Or, cheap Boston hotels if you're coming this way.